This card features the adorable Anya Blooms stamp from The Greeting Farm. I had colored her a few weeks ago -- holding sunflowers -- when my Dad gave us a Mammoth sunflower for the kids from his garden. I finally decided tonight to make a card with this image. What do you think? I die cut the edge of the yellow layer and punched holes through the smaller circles, stitched with mandarin twine. The larger circles were the perfect size to embellish with clear rhinestones. All is cute! ;) Thanks for sharing at Sister Act Card Challenge! Gorgeous card Jen :-) the image is very cute and I love the photo's ! 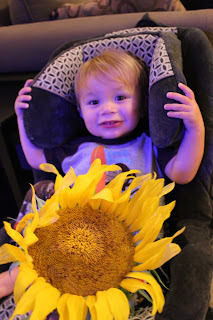 Gorgeous boy and the sunflower is a stunner ! I never saw one so huge ! Love it - sweet image and I love what you've done with the twine.